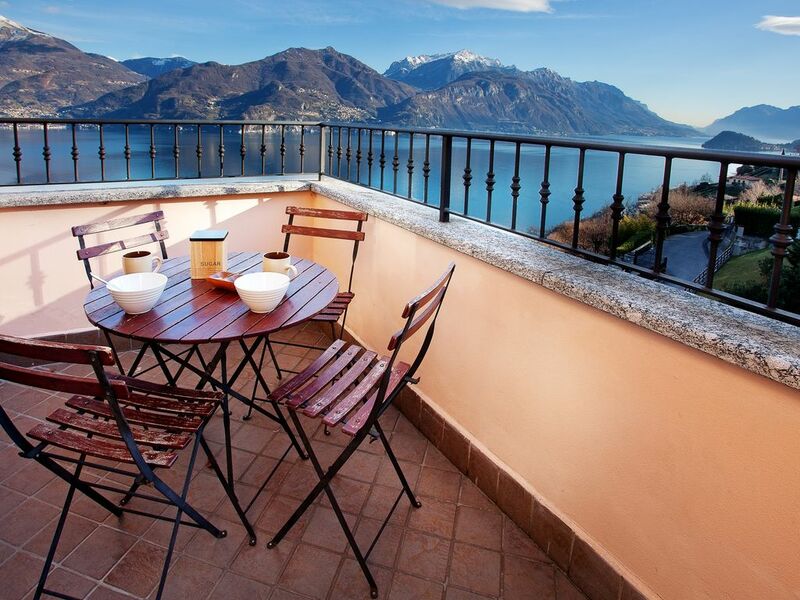 This apartment is ideally located to enjoy Lake Como. If you are looking for peace of tranquility with breathtaking lake views yet just 5 minutes drive to the lakeside town of Menaggio, this apartment will delight and exceed your expectations in equal measure. The home's interior has been painstakingly designed by an interior designer with bespoke sofas and beds with can made up as a doubles or twin beds to suit your needs! The pool is the perfect way to relax with views unsurpassed by anything you are likely to see in the whole area! The village of Menaggio is a beautiful lakeside village with every possible amenity here with palm lined lake walks, ferry (just a 20 min boat ride to Bellagio) as well as all major villages along the lake, villas, churches, piazza's etc. However, if you are looking for a little rejuvenation, sunshine and a haven for relaxation why not pull up a chair on the balcony, take in the magnificent views and toast your stay in Lake Como. Salute! We relocated to the lake in 2007 from the Uk and live locally so are on hand whenever our guests need to get in touch! By renting your holiday home with us you can be sure of gaining the inside track to the lake and the local's view to ensure you get the very most from your stay and enjoy a personal experience second to none. By staying here with us we can recommend where to eat where the Italians dine, where to a hire a boat at the most competitive cost, show you the hidden places with the locals shop from finding the freshest baked bread to the best markets to the trattoria's where the Italian's dine away from the tourists mass or the very best bar's where the tastiest snacks keep coming with the drink's! If you need to hire a scooter or cycle, find the best hiking routes, or pathways around the lake for scenic walks we will point you in the right direction. The photos and views speak for themselves. The fantastic panoramic lake views are simply sublime. The home affords spacious living inside and out on the private garden and lake view balcony plus a swimming pool to relax in with more majestic lake and mountain panorama. Easy off road parking or just a 5 minute drive to amenities from restaurants and bars to ferry and lido beach bar. There are 3 restaurants including a pizzeria located within 10 minutes of the lake. Hence we receive many returning requests from guests. The home is located in Menaggio, the largest village on the lake with all amenities ideally located opposite Bellagio and just a ferry ride to Varenna, equally as pretty. There is a real local feel to the place. Meandering cobbled paths, a weekly market with superb local produce and seasonal ingredients, in additional to the pool at the home there is also a wonderful brand new lido to take in the sun and swimming pool to cool off next to the lake, authentic wine and cafe bars and superb home made gelateria to name just a few highlights. In short we offer more then letting our holiday home. We offer a unique insight into living like a local here on the lake to ensure you get the very most from your stay from the minute you arrive ensuring an unforgettable and personal experience. The bathroom with shower, wc and bidet has been beautifully finished. The living room has been designed with a boutique feel in mind with clever use of space with hand made sofa, glass table and stretch canvass paintings which enhance the contemporary feel. Flat screen TV and DVD with selection of DVD films. The fully equipped modern kitchen has been designed to cater for even the most enthusiastic cook with everything from plentiful cookery books to the dishwasher! 1.5 hours to San Moritz and Madesimo. 50 mins to small local ski resort of Lanzo. 5 minutes drive to golf course in Menaggio. Notes on accommodation: All well behaved children welcome. Outside: Private garden with decked area and lawn plus private balcony with lake view and dining table for 4 guests. Shared pool (8 apartments in total). Shared pool open June to September subject to weather. Steps to reach pool. Home itself is the penthouse apartment located on the top floor of the building accessed via steps. Inside the home is located all on one level. Utility Room: Utility room with washing machine and drying rack. Cleaning / Towels / Linen / Maid service: Full cleaning service carried between each guests stay. All linen, towels and bedding provided. Refundable precautionary 350 damage bond due on arrival refunded on departure in full. We politely request our guest to remove recycle responsibly and refuse waste on departure. We had a wonderful week in Menaggio on Lake Como. Barrie and Julie (the property managers) met us in town and led us up to the apartment. This was good, as the road has many twists and turns. They gave us a great introduction to the apartment as well as an overview of the area and suggestions of things to do, places to see. We followed their lead and took the ferries to Bellagio and Varenna, rented a boat one day, and drove over to Lugano another. Barrie even suggested a gelato place in Milan (we stayed there prior to flying back home), which was fabulous. The apartment was great. Everything you might need. We ate in most mornings and two dinners and found everything we looked for. A car is a necessity as the apartment is up the hill (which provides the fantastic views) and makes walking down to town quite a challenge. The pool sits just above the apartment and has several chairs for lounging and an outdoor shower. Thanks again to Barrie and Julie. I have a feeling we'll be seeing you again. Beautiful setting, a lovely apartment. A lovely stay in this spacious, clean, comfortable and well equipped apartment. The views of the lake and mountains from the balcony are magnificent. The apartment is located in a peaceful area but close to Menaggio for restaurants, ferry trips etc. We really enjoyed our stay at beautiful Lake Como. Fully equipped apartment with views from all rooms, pool (shared) with a stunning view over lake Como. We enjoyed an unforgettable stay at this outstanding apartment! Waking up in the morning with the ultimate view of the lake and mountains is invaluable. The apartment is located most beautifully over the lake which allows for the million dollar view from almost every room. Still it is in enough distance to the noisy road while only a few minutes from the center of Menaggio. The apartment is well equipped with everything you need for your daily needs. It is extremely well maintained and clean as well as the overall property. The reason is that the owner takes great care of the property. It happened that the owner was present the same time we've been at the apartment and he was helpful in any aspect. He gave us great tips where to go shopping and also for restaurants. This made our vacation even more personal and relaxed. The apartment is furnished with high quality furniture where you will feel at home immediately. The best place to escape and enjoy the Italian dream! We will come back to this apartment at Lake Como because of this location of our choice! And we will definitely recommend this place to our friends. Wine tasting courses arranged-please ask for details. Cookery courses available. Boat hire arranged on request. Lido in Menaggio with beach and pool. Golden sand beach 10 mins approx south in Lenno. Travel to Milan Malpensa, Milan Linate (1 hour 45 minutes) or from Bergamo (2 hours). Car hire recommended for the apartment as 5 minute drive only to the village centre or 25 minute walk. Menaggio village 5 minutes drive for palm lined lakeside walks, ferry, restaurants, cafe bars, shops, lido beach, pool, supermarket, gelaterias internet point, bank, crazy golf! Parking-paid & free, available in village. We can recommend places to visit, restaurants etc to help you get the most from your stay. Bellagio is just a ferry ride away! The majestic gardens of Villa Carlotta in Tremezzo are 10 minutes by car or take the ferry. Villa Balbianello (James Bond 2006) is 15 minutes drive. Menaggio, the provincial Lake Como village, as you would expect is home to your every convenience from supermarkets and banks to ice cream parlours, bars and superb restaurants. Como city-cafe bars, boutiques, church, cathedral plus visit Volta museum where Alessandro Volta invented the battery. Milan-fashion, football, food and culture galore inc the Duomo cathedral, La Scala opera house and Parco Sempione-an oasis amongst the metropolis of Milan opening to some excellent lounge bars for an early evening aperitivo! Monza grand prix held mid September each year is approx 1 hour 15 minutes drive. Fox town designer shopping outlet in near by Switzerland (45 minutes approx). Lake Lugano is also worth a trip (30 minutes). Booking Notes: 25% deposit to book, 75% of balance 12 weeks prior to stay after which no refunds apply. 350 euro refundable bond paid on arrival refunded on departure. Changeover Day: Saturday preferred from May to September (peak season) Rates advertised for available unsold weeks only. Flexible October-April. Notes on prices: €95 Euro final cleaning carried out on departure included in the rate. 2 euro per adult and 1 euro per child tourist tax per night for stays April to October Advertised rates apply to available unsold weeks only. Rates may fluctuate due to market conditions.